Moscow Choral Synagogue – the oldest synagogue in Moscow (Bolshoy Spasoglinischevsky lane, 10) in which the Chief Rabbinate and works seminary. In 1886, the chairman of the Jewish community Lazar Polyakov purchased land in Spasoglinischevskom lane. In this area a Synagogue building was erected. The construction of the building was conducted from 1887 to 1891 by the architects Eybushitts and Rodionov. Later, the building was rebuilt by architect Roman Klein. It was his idea to retrospectivist. Free stylization of all eras allowed Klein to create the interior of the synagogue, filled with historical allusions and quotations. The interior of the synagogue contains ties with the traditions of Western European religious architecture. Is interesting that all three architects – the authors of the synagogue – were not Jews. Sergei Rodionov was descended from an old Russian noble family, Roman Klein came from the German community in Moscow and Eybushitts – Austrian. Customers have demonstrated the desire of cultural assimilation, which was popular among the educated Jews in the XIX century. In February 2001, under the patronage of the Mayor of Moscow Yuri Luzhkov, the reconstruction of the synagogue, which is part of a major joint project of the Russian Jewish Congress, the Jewish community of Moscow and JDC – the creation of the center “On the hill”. The project cost is over $ 20 million and includes the construction of a Jewish children’s home, social and community centers. May 16, 2001 opening ceremony of the silver dome, topped with a Star of David. It was open sculpture “Bird of Happiness” – a symbol of friendship between the peoples. Symbolic Wailing Wall built of cut stone complete the monument. In spring 2005, the President of the Congress of Jewish Religious Organizations and Associations in Russia was elected Israeli billionaire Arcadi Gaydamak. 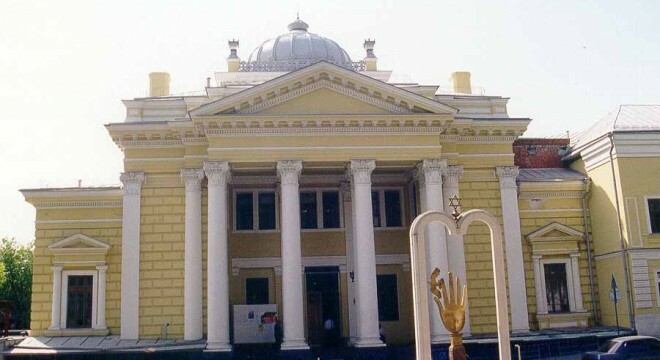 Gaydamak and other sponsors CJROA spent a lot of money for the reconstruction of the Moscow Choral Synagogue – the main symbol of pride and CJROA. September 14, 2006 in the synagogue celebrated the completion of restoration work that lasted several years. October 18, 2006 celebrated the 100th anniversary of the Moscow Choral Synagogue.